From the Lent Madness site: “Yesterday, Brigid of Kildare took care of Dionysius the (evidently-not-so) Great 63% to 37% and will square off against Kamehameha in the next round.” On the St. Luke’s site, Brigid also won by 60% to Dionysius’s 40%. The next match up is Bernard Mizeki vs. Jackson Kemper. Bernard Mizeki’s commitment to proclaiming the Gospel to the people of Africa led to his untimely death. Yet his courage, sacrifice, and commitment inspires thousands to gather every year to celebrate his life. 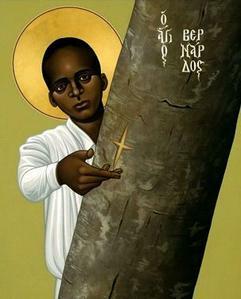 In 2013 Bernard Mizeki’s festival was held at his shrine for the first time in over five years. Before that the event had taken place in an area located about seven miles away due to the actions of former bishop Nolbert Kunonga, who barred any pilgrims from the shrine. This festival gathers over 20,000 people for two days to dance, sing, and pray. After a religious service, thousands of pilgrims swarm to the hill where it is believed the body of Bernard Mizeki miraculously disappeared. Pilgrims draw water from the nearby stream believed to have been used to clean out Bernard Mizeki’s wounds. The water is believed to hold healing qualities...Read more here. The indefatigable Jackson Kemper established much of the Episcopal Church of the Midwest, including the Dioceses of Kansas, Missouri, Indiana, Wisconsin, Iowa, and Minnesota, as well as the seminary Nashotah House. 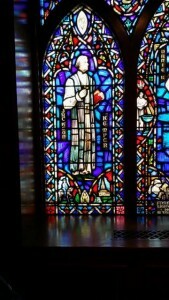 He is memorialized in churches throughout the region, as in this stained glass window from St. Paul’s, Kansas City, Missouri. In the lower left-hand corner, he is riding a horse — a fitting tribute, as he covered a territory of 450,000 miles, mostly by horseback. He also appears in the novel The Deacon as a ghost who haunts Grace Church, Madison, Wisconsin. He might not have liked being fictionalized. According to his biographer, “He did not care for Shakespeare, and abhorred Byron.” He did, however, enjoy the occasional novel (“particularly, it is remembered, Judge Haliburton’s ‘Sam Slick’”) and “let his children read Scott’s romances, but not too many of them at a time, fearing lest they should acquire a taste for fiction.”…Read more here. You are currently reading Lent Madness: Bernard Mizeki vs. Jackson Kemper at Blog of St. Luke in the Fields.